Hey, kids, meet Wonder Woman, one of the few female superheroes. Which one of these LEGO minifigs is not like the other? 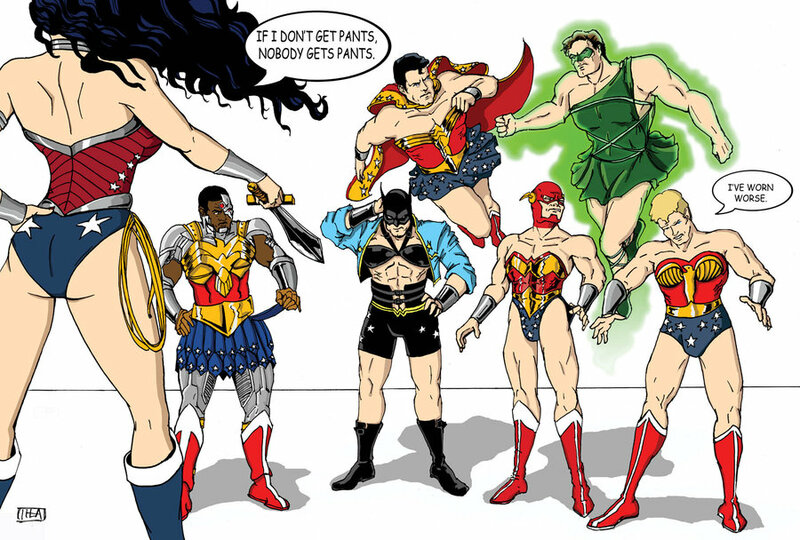 Why do you think the most powerful and famous female superhero is shown in her underwear? Read more about about sexism marketed to kids through LEGO sets here. This entry was posted in Most stereotyping *SSS*, Superheroes, Toys & products and tagged Lego, sexist Lego, sexist toys, Wonder Woman by margotmagowan. Bookmark the permalink. I think the fact that there is only a few female superheros.. it quite odd. Although i know more boys watch these movie than girls.. If there were more female superheroes, front and center and not sexualized, more girls would watch. shes wearing that because that has ALWAYS been her costume, there not going to change it because some woman thinks it is sexist. Because “some” woman thinks its sexists? Actually, a lot of people think its sexist. Kids do without having a label when they ask: Why is Wonder Woman in her underwear? Did you get permission from the artist to re-blog her work? It’s a pretty big no-no in the deviantArt world to post someone’s work without their permission, even if you give credit. My last experience was a post an artist did on superheroes that pose like Wonder Woman (http://margotmagowan.wordpress.com/2011/08/10/if-male-superheroes-posed-like-wonder-woman/) that picture was all over the internet, and then later I did an interview with her on Reel Girl. I will send the artist the link and get her thought. Cynthia Sousa emailed me back that deviantart is open to the public, she’s fully aware her art can be downloaded, and that’s she’s grateful for the publicity.